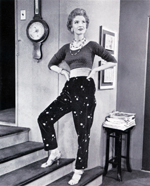 Julia Meade in a photo from the New York City production of Double in Hearts, October 1956. Behind her are William Redfield (who married Julia's sister Betsy) and Neva Patterson. The original production opened first at the National Theatre in Washington (see ad on right and below) for two weeks before moving to Broadway. This was Julia's second Broadway outing in a starring role, following the 1954 original production of The Tender Trap in which she played Jessica. For Double in Hearts, William Glover commented in his APN Broadway column on the above photo: Julia Meade, one of television's best known saleswomen, appears here in a scene from "Double in Hearts," a comedy opening at the Golden Theater Tuesday night (Oct. 16.) Julia (seated) and William Redfield and Neva Patterson (at back) make up a romantic triangle. As the key angle, Julia describes herself as "a many angled blonde who isn't at all what she appears to be." This is Julia's <second Broadway appearance>, a goal she has aimed at since childhood. Oddly, she doesn't expect to have more than the normal amount of opening night jitters. To her, the most terrifying thing is getting through a television commercial.